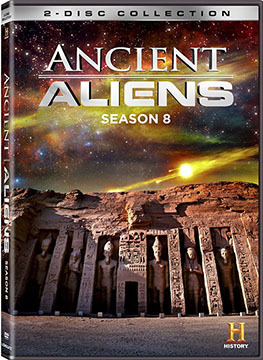 ANCIENT ALIENS SEASON EIGHT travels the universe across an expanse of tens of thousands of years to the present day as we investigate the possibilities and probabilities of life beyond Earth. We look at the unexplainable enormous man-made caves, structures, crop circles containing encrypted messages, and complex mathematical and astronomical equations perplexing our leading scientists. Experts have found thousands of strange drawings of beings with blue skin, multi-limbed humanoids, and more. Could many of these beings depicted throughout the world and across time actually reflect extraterrestrial visitors? Episodes include: Aliens BC; NASA's Secret Agenda; Aliens and Robots; Dark Forces; Alien Evolution; The Other Earth; Creatures of the Deep; Circles from the Sky; Alien Wars; and The Forbidden Zones. Includes interviews with David Hatcher Childress, Giorgio Tsoukalos, Erich von Daniken, Mike Bara, William Henry, and many others. Ten episodes from Season 8 packed onto 2 DVDs.